Leucism in Birds /Hawks Aloft Inc.
Several weeks ago Hawks Aloft staff made the trip to Monte Vista, Colorado for the Monte Vista Crane Festival. Upon their arrival they started to hear rumors of a Red-tailed Hawk haunting the edges of the wildlife refuge. But this was no ordinary Red-tailed; defying the colors that dominate the species, this was a largely white Red-tailed Hawk, with only the occasional rust or brown feather that birders might expect when it comes down to identifying such a bird. 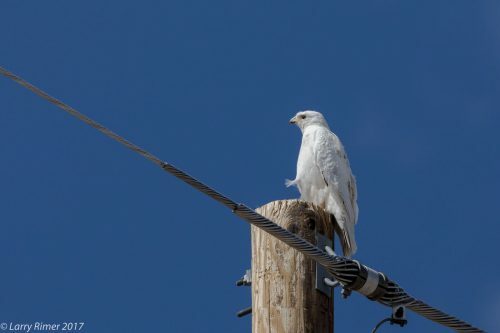 This particular hawk—a leucistic one—isn’t an entirely common sight, and Hawks Aloft staff and volunteers were thrilled to spot it on their first day out. It is hard to get an accurate grasp on how common leucism is in birds, but Project FeederWatch, an extensive online database of bird species observed and reported by citizen scientists, has recorded only about 1,600 leucistic birds of any species out of 5.5 million distinct birds indicated. But what exactly is leucism? And why does it happen at all, albeit infrequently? Leucism is a blanket term for abnormal plumage conditions caused by genetic mutations. This genetic inheritance prevents a pigment—melanin—from being carried and deposited in the bird’s plumage. This condition can end up looking like the Red-tailed Hawk spotted in Colorado, or it can also be displayed as white patches throughout the body, in places where they wouldn’t normally occur in a species. Sometimes the condition also manifests as an overall paler plumage in the bird, as if its color was diluted. Leucism is quite different than albinism, another similar (and similarly unusual) condition in birds. Considered to be extremely rare in the wild, albinism is marked by a total lack of melanin. Leucism, notably, only impacts the bird’s feathers, while albinism is apparent in the feathers and elsewhere. For example, albino animals almost always sport red eyes, as well as pale pink or red skin, feet and bills. Leucistic birds usually have normally colored eyes, skin and feet; the condition of leucism only impacts the feathers. Although it is quite exciting to see a leucistic bird in the wild, they do face certain challenges that make their lives difficult. These birds, without the protective camouflage that other animals have, become more vulnerable to predators. Additionally, plumage colors play an important role in courtship and mating; as such, many leucistic birds may be unable to find suitable mates. Last but not least, the dysfunctional melanin production in leucistic bird’s feathers may even make it harder for them to fly. Since melanin is an important structural component to feathers, birds lacking the proper amount of this pigment may have weaker feathers that are more prone to breaking and less able to insulate the body against cold and damp. 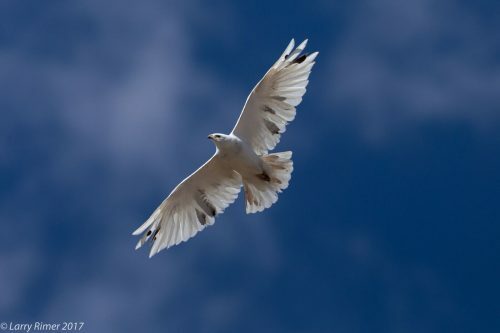 Leucism can be a great burden on the bird, however, it does remain rare. As such, when a birder spots a bird such as this, it allows for a moment of pause as we consider the great complexity of avian life, and the beautiful and observable variety among these amazing animals. I am an amateur birding photographer and have a special love for birds of prey. I just came back from another unsuccessful Snowy Owl hunt and feeling down after going back to work after the holidays ! My coworker and I were finishing maintenance at JJLAB, Newport News VA when we went outside and admiring the deer nearby. My coworker looked up and asked me what type of white bird what circling 200 ft. directly above us! At first I thought it was a Sea Gull but then I realized it was a leucistic Red-tail Hawk with only a faint dark red wing tip that was visible in the full sun above it! This was only the second time since November of seeing it up close and finally had someone to see it with me. Simply amazing and beautiful ! After reading this article in November, I realize how lucky I am with white birds ! Might not be the Snowy this winter, but seeing this wall white hawk in my area is certainly an exciting encounter !! I will hopefully have my SLR camera more readily available at my lab and feel confident that I will see it again !!! Thank you for this article and the great information you provide on leucism. We have one in Minnesota, Eden Prairie 494 just North of Valley View Road. Its been there for the past 4 years. I wish i could get close to get a nice picture of it. It is beautiful. there’s a couple whitish magpies with leucism here where i live. i’ve been fortunate enough to spot them a couple times when i was younger. after i saw them i wrote a poem about it, well, it inspired the poem … in the poem the magpie could talk, lol. years later a girl liked my poem and did some art for it. next thing i know i had a picture ebook on leucism!! them white critters made that happen, lol. happy days to you. Thank you for writing! THe book is adorable! Thank you for sharing that with us! i have seen one today, red tail hawk in aiken,sc. Mostly WHITE with red spotting and tail. it was huge, big as buzzard. i think of it as omen.he was beautiful. Yes, we share your admiration of the beautiful plumages of birds of prey. They are incredible. I wanted to share a local pair of Red Tail Hawks including a leucistic variant. we took a few pictures in MA today, and were very pleased to see them. As I do not see a way to post an image, feel free to let me know where to send such. Be sure to remove the spaces when typing in the address. A pair of red tails returned to last years nest and were doing fine until the bomb cyclone hit. After the storm, the male continued deliveries for a day and a half, then disappeared. Now I see a hawk atop the tree, adjacent to the nest some mornings, and one morning saw a hawk climb out of the nest, then fly away. No more back and forth, and only one hawk. Please comment as to likely scenarios and also likelihood of another couple raising a family again this year. If the male disappeared, the female would not be able to raise the young by herself. She would be forced to leave the nest to feed herself leaving the eggs exposed to the cold. Chances are good that next year, the surviving female will take a new mate.